Teaching little ones to read begins with the alphabet. These alphabet activities for preschoolers are great for teaching and reinforcing the ABCs. Teaching the alphabet starts early with a good collection of alphabet books. This allows toddlers and preschoolers to become familiar with the letters of the alphabet in a natural way. There’s no drill involved. Just reading stories to plant seeds for later learning. Later, you can use flash cards, worksheets, printables, and games to teach letter identification and letter sounds which will set the stage for combining those letters and sounds into words and then into sentences. This ever-growing collection features a great selection of all of those things to help you teach your preschoolers the alphabet. • Letter Recognition Worksheets – Download this set of free letter recognition alphabet worksheets. They’ll help your young learners practice letter matching, handwriting, and more. • Johnny Appleseed Letter Matching Game – This fall, use this free printable Johnny Appleseed letter matching game to teach and reinforce letter recognition with your preschoolers. • Printable Alphabet Writing Cards – Do you have a little one who is learning to write their letters? These printable alphabet writing cards are great for on-the-go handwriting practice! • Horse Themed ABC Matching Game – Add this ABC match game to your cowboy, cowgirl, and horse themed homeschool preschool lessons. Kids will match letters and beginning sounds. • Free Wild West Alphabet Puzzle Printables – Alphabet puzzle printables help your preschoolers focus on letter recognition, letter matching, and beginning sounds. These wild west ABC puzzles are fun! • Scarecrow Themed Alphabet Worksheets for Fall – Encourage your preschoolers to practice the alphabet with this S is for Scarecrow alphabet worksheets. Perfect for your autumn literacy centers! • Cover the Letters: Fine Motor Alphabet Activities – Preschoolers will practice letter recognition and build fine motor skills with this “cover the letters” busy bag. Fine motor alphabet activities for kids! • Playdough Alphabet Mats Busy Bag – Literacy fun for little ones! Grab this fun set of Play Dough Alphabet Mats for young learners. They will love creating letters with play dough and focusing on beginning sounds. • Alphabet Preschool Handwriting Practice Pages – This set of alphabet writing pages is perfect for preschool handwriting practice as well as teaching letter sounds. One hands-on page for each letter of the alphabet! • One Fish Two Fish Printable Alphabet Matching Cards – Have fun with these One Fish Two Fish printable alphabet matching cards! Preschoolers will work on letter identification and matching. • Christmas Alphabet Hunt Pages for Preschoolers – Are your kids having a hard time focusing on their homeschool preschool lessons? Add these Christmas Alphabet Hunt pages to your homeschool lessons! • Printable Alphabet Clip Cards – Help your preschoolers practice their ABCs with six sets of alphabet clip cards. These cards focus on letter identification, beginning sounds, and ending sounds. • Beginning Sounds Alphabet Clip Cards – Are you teaching beginning sounds? These printable alphabet clip cards are great teaching tools for early learners. • Free Printable Feed the Monster Alphabet Game – Teaching the ABCs should be fun and engaging. It will be when you prepare this Feed the Monster alphabet game for your preschoolers! • Simple Hands-On Letter Matching Game for Preschoolers – You won’t believe how easy it is to set up this hands-on letter matching game for preschoolers. Kids will work on letter recognition and motor skills, as well. • Hands-On Alphabet Games for Preschoolers – These hands-on alphabet games for preschoolers are perfect for teaching letter recognition, ABC order, and beginning sounds. 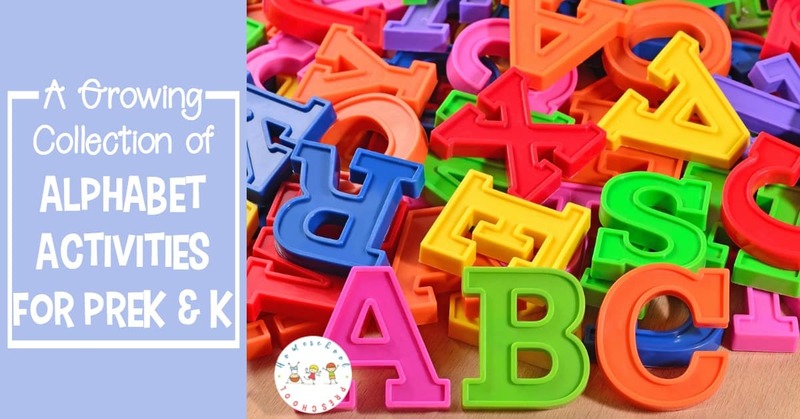 • 5 Simple Tricks for Teaching the Alphabet to Preschoolers – Teaching the alphabet to preschoolers doesn’t have to be intimidating. Just use these simple tricks and have fun in the process! • 30 Engaging Alphabet Activities for Preschoolers – Teaching little ones to read begins with the alphabet. 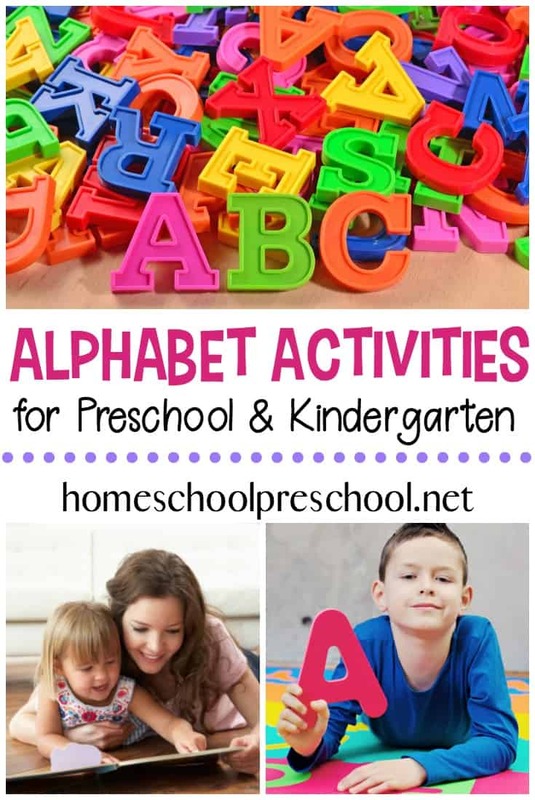 These alphabet activities for preschoolers are great for teaching and reinforcing the ABCs. • 50 of the Most Engaging Alphabet Books for Kids -Are you getting ready to teach your kids the alphabet? Introduce your kids to letters and their sounds with this amazing collection of alphabet books for kids! • Hand Print Art for the Alphabet by Crystal and Co.
What are your favorite alphabet activities for preschoolers? Be sure to leave a comment below, and let me know!